Freshman Jahdai Alcombrack had 21 points to lead Bellevue to a 52-46 win tonight at Courter Family Athletic Pavilion. 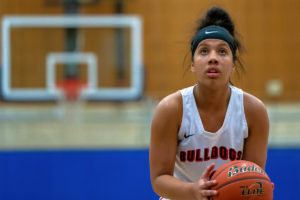 The evenly matched game in nearly every category was ultimately won at the free throw line, as Alcombrack scored 10 of her 21 from the line. Bellevue outscored the Rangers 19-12 in free throws in another low scoring first half game for Bellevue as the ‘dogs led 20-16 at halftime. Bellevue shot 71% from the line in the third quarter that featured more offense as BC stretched their lead to six with an 18-point quarter. With three minutes remaining in the game Olympic cut the lead to one point at 42-41 on a jumper by Brittni Blake. The Bulldogs responded with a bucket by Alcombrack to keep Olympic away from taking the lead. With Olympic still within reach at 47-43 with 15 seconds to go, Bellevue’s Amanda Luckett, Natalie Amos, and Jorie Lambert made five-of-six free throws in the closing seconds to seal the win. Bellevue is now 4-2 (5-10 overall) and gave Olympic their first league loss (5-1, 6-14 overall) bringing the Bulldogs to one game back of first place behind the Rangers and Skagit Valley (also 5-1). The Bulldogs take their three game winning streak into next Wednesday’s home matchup against Everett with tipoff set for 5:00 p.m.